If the tightrope walker gets the balance wrong then that’s probably the end….as human beings I often wonder if many of us stop to think and ask ourselves about the imbalances in our own lives? Whether its work versus play, or eating and drinking sensibly, taking some form of exercise, being able to take steps to quit something that we know isn’t good for us – take your pick this list is endless. The old adage “moderation in everything” is a wise statement, yet I’m not sure this comment is followed by many. 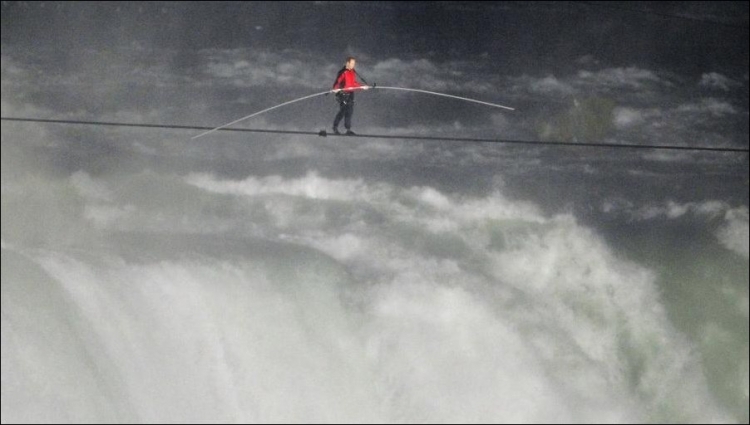 We are not tightrope walkers so we think it does not really matter about getting the balance right on any front. If you could go to your local church yard and interview all those buried there, not one person would tell you they didn’t spend enough time working, the opposite would probably be true – they didn’t spend enough time playing. This entry was posted in Kevan. Bookmark the permalink.